Some of the most powerful stories we share at CPL are about our full-service teams because their physical transformation is often the easiest to see. However, the emotional transformations that occur through our home companion partnerships are just as impactful, though may not be as readily visible. Home companion dogs are placed with individuals of all ages to provide comfort, companionship, motivation, and sometimes skills useful in the home environment. 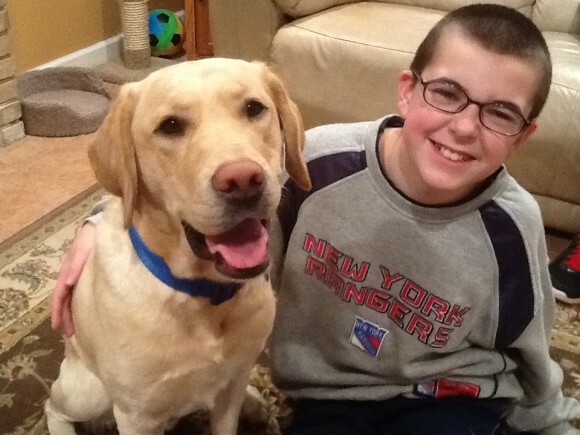 This was the case for Thomas, a twelve-year-old boy with Autism who graduated with home companion dog, Marcum, this summer. About nine years ago, Thomas’ mother, Jonelle, began searching for a companion dog for her son. Having recently learned about this type of service and hoping Thomas would benefit from it, she searched all over the United States for an organization that could help Thomas. Thanks to a local news program, Jonelle learned about Canine Partners for Life. As the news program interviewed a CPL graduate, she became more impressed with CPL and decided to contact us. Fortunately, CPL was not far away from their home in New York. Marcum is Thomas’ second dog from Canine Partners. His first dog, Contessa, shadowed Thomas during his early intervention years, but she developed some health issues and needed to retire early. The family faced the tough decision of whether to apply for a successor dog. Thomas was getting older and they weren’t sure about bringing a new dog into their home. Eventually, they determined Thomas had been without a dog for too long and applied for a successor with CPL. The hope is that Marcum will continue the work Contessa started and will foster Thomas’ independence long into adulthood. From the very first day Marcum came home, he and Thomas have been inseparable. Marcum helps Thomas slow down when he walks and gives him someone to talk to when he feels anxious. He also makes Thomas feel safe from bullies. 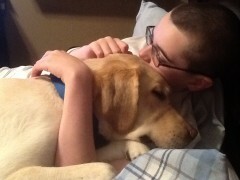 Thomas writes, “I know my dog won’t hurt anyone but maybe bullies would just be stopped when they see my dog – they will pet it and forget to bother me.” This is a critical point for Thomas as he is almost a teenager. But, Jonelle isn’t worried because Marcum makes him feel safe, and Thomas is becoming less concerned about bullies as time goes on. Thomas understands friendship and love very clearly because of Marcum’s kindness. Having a CPL dog as a part of their family has undoubtedly changed Thomas’ family for the better and they are grateful for the love and independence Marcum provides.